American lawyer and politician; born at Bechtheim, Hesse, Feb. 7, 1851. He accompanied his parents to Portland, Ore., in 1857, when he was but six years of age. He was educated in the public schools of Portland, was admitted to the bar in 1872, and is now (1905) a member of the law firm of Dolph, Mallory, Simon, & Gearin. He early developed a capacity for politics. 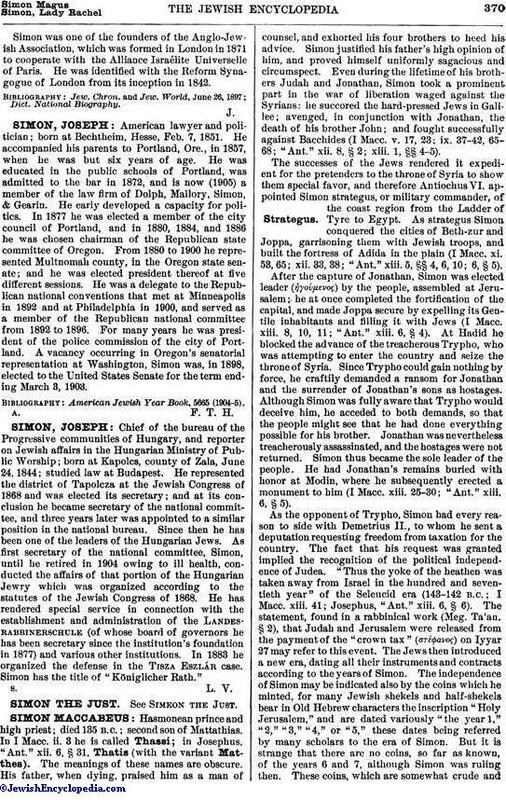 In 1877 he was elected a member of the city council of Portland, and in 1880, 1884, and 1886 he was chosen chairman of the Republican state committee of Oregon. From 1880 to 1900 he represented Multnomah county, in the Oregon state senate; and he was elected president thereof at five different sessions. He was a delegate to the Republican national conventions that met at Minneapolis in 1892 and at Philadelphia in 1900, and served as a member of the Republican national committee from 1892 to 1896. For many years he was president of the police commission of the city of Portland. A vacancy occurring in Oregon's senatorial representation at Washington, Simon was, in 1898, elected to the United States Senate for the term ending March 3, 1903.